National cycle database BikeRegister is partnering with bike storage specialists Cyclepods to attempt to shut down bike crime at rail stations across the UK. The statistics for bike crime are highest at rail stations, where bikes are often left all day while commuters go to work. British Transport Police recently revealed that a total of more than £1.5 million of bicycles have been stolen from railway stations in 2014, equating to 14 bikes being stolen from stations every day. Cyclepods have been working with National Rail networks since their inception in 2007. From traditional stands to their innovative Easylift+ solutions to state-of-the-art Cycle Hubs, the company has to date installed nearly 5,000 spaces across the UK rail network. 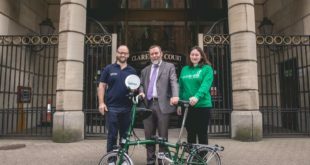 The new partnership with BikeRegister will introduce extra crime deterrents including warning signage across existing and future Cyclepods (www.cyclepods.co.uk) bike parking installations.